The SM-2512 Link Protector® provides a fully managed automatic link backup capability to twelve "mission-critical" 10BaseT/100BaseTX Ethernet links. The system protects vital connections to servers, routers, firewalls, and other key Ethernet devices that require fail-safe link operation. 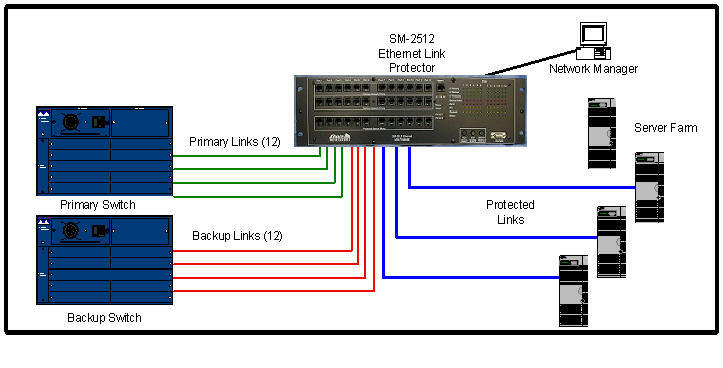 The SM-2512 operates by non-intrusively monitoring a "primary" link and, in the event of a failure, automatically switches to the backup link; or switching can be controlled externally via SNMP, RS232, Telnet, or front panel commands. The Link Protector® does not require any additional network cards in a server; is completely transparent in normal operation; and does not affect IEEE 10BaseT repeater budget. The SM-2512 is designed to be mounted in a standard 19" datacom/telecom rack or tabletop.